Exhibiting at tradeshows can have a bad reputation. They’re expensive. They’re complicated. You need a booth. You need something fantastic to get everyone’s attention. You need staff. The staff need to travel, have hotels and special shirts. Someone else’s booth is always bigger, better or in a prime spot. And what can you possibly give away that people will keep and remember you by that doesn’t break the bank? And, of course, because everyone is always too busy, no one has really planned for the show until the last minute – so your worst fears and expectations are realized by what you can improvise at the last minute. This is no way to live. Or do business. While many B2B companies have shifted away from traditional forms of marketing (including print advertising, telemarketing, direct mail and tradeshows) in favour of digital marketing tactics, exhibiting at tradeshows does offer tremendous opportunities for B2B businesses. But (yes there’s always a but), you have to plan in advance, spend an appropriate amount of your budget to do it properly and commit to it from the top down in your organization so that it is well supported and planned as an important part of your marketing, lead generation and sales strategy. The first truth about tradeshows is that, to exhibit right and to take full advantage of the tradeshow’s opportunities, you need to decide the year before that you will exhibit there the next year. In order to effectively make the decision to exhibit at all, ensure that if you’re not currently exhibiting at the show, you at least attend the show the year before. Walk the floor. Look at the companies that exhibit and the people who are attending. Is this your target audience? Do you see your competitors? How big is the show – can you make an impact? Is there a major show sponsor that is complementary or competitive to your business? You need to determine if this is even a show worth exhibiting at. Just because your competitors are there doesn’t mean it’s right for your business. The good spots will be taken – many companies return year after year and get the prime spots because they automatically book in advance. You need to do the same. The best sponsorship opportunities will be taken – while these last longer than the spots on the floor, many of the best sponsorship opportunities get snapped up right away. There are often smaller sponsorships available up until a month or two before the show, however. Plan it into your budget – since budget planning usually starts in the fall the year before, understanding the show costs for budgeting purposes is key to ensuring that you are able to do it right when the time comes. Plan major marketing and communication changes around show dates – if you are re-branding, re-doing your product literature, launching a new product or having any other significant change in your business, ensuring that you can communicate it effectively at the show makes sense. Since you will want product literature, business cards and logoed items there, don’t leave updates and printing to the last minute – or do it when the show is over to avoid confusion. Physical booth – this should include the show booking, the booth itself, any additional POS for the booth, product you’ll be exhibiting, booth furnishings including tvs, video screens and projectors, booth video on back up usbs, flooring, electrical, lighting, booth move in/out planning including put up, tear down, shipping and storage. Booth staff – this should include who is working the booth and a shift schedule, travel, hotels, rentals, attire/uniforms, local translators, name badges and individual business cards. Product literature and promo Items – what do you need printed and produced for the show and in what languages and quantities for each brochure, promo items branding and shipping. Pre-show awareness – this should include email marketing, website posting, blogs, social media, print ads, show sponsorships, show guide listing, email signature updates. Post show follow up – thank you emails, lead follow up email/phone calling, blog posting, social media, remove show from website and email signature and enter leads into CRM system. Show events, conferences and learning – participate as speakers and leaders or as attendees and sign up for learning, conferences and events during the show and what is the plan to disseminate information from each opportunity. Internal show post-mortem – calculate ROI, present learnings, leads and determine if there is value in exhibiting or attending next year. You won't be able to do this unless you’ve exhibited at the show before but understanding the ROI for each particular tradeshow will help you to make a smart business decision about participating again. If the cost per lead generated from a show is too high, you'll need to consider if this is a worthwhile show to exhibit at. While building exposure and awareness within your target audience has value, if the show does not drive sales leads, there are other ways to spend that marketing money effectively to drive lead generation and build awareness. That said, if you are doing a B2B tradeshow right and you have confirmed that your target personas are attending, there’s no reason you shouldn’t be generating valuable sales leads. Remember to start evaluating your ROI after the length of your sales cycle. If it takes you 3 months to sell your product or solution, you are unlikely to be able to attribute revenue before that time, and sometimes even a few months longer. Just like you are the experts in your business and industry, there are other experts you can rely on to help you make the very best impression at your tradeshow. Look for booth experts to help you design and produce a booth that works for your business, the industry and the show space you’ll be occupying. These experts will be able to provide guidance on the latest booth and display trends, recommend signage options for maximum visibility, as well as help you decide what type of booth will suite your business best. In many cases, these companies also offer booth shipping, set up, tear down and storage. Work with an infotainment or engagement company if you need help drawing people in. Some businesses don’t have a lot of visually engaging bells and whistles to share at tradeshows that help to grab attendee attention. Often it’s just the nature of the business or industry. But that doesn’t mean that your exhibit has to fall flat. These experts can help you find ways to increase engagement at the show through things like infotainers (speakers/entertainers who educate and sample), gamification and other attendee interactions. If you’re not giving away product samples or significant incentives, use a reputable promotional items company to help you find a memorable, useful item that attendees can take away. These companies will be able to give you a list of suggestions that might potentially fit your industry or business - but they are also on top of the latest trends – bringing your business into the present and keeping the branded item top of mind. Don’t leave booth staff to their own devices. Instead, build a tradeshow playbook and ensure that each of your tradeshow participants has a copy. Any other local information that could be useful or interesting such as restaurants, hospitals, suggested local tourist locations, etc. Outline of the lead collection process – is it a badge scanner, do you ask for a business card, a booth book or iPad to capture info, etc. A week before the show, hold a general meeting with all exhibit staff to review the playbook, answer questions and set expectations around the schedule, attire and participation. There is nothing worse than walking past a tradeshow booth where the staff are not engaged. It’s important that exhibit staff look inviting and interested in talking to attendees rather than bored or scared. It helps if they’re excited about what they have to say as well. If you’ve targeted the tradeshow attendee personas properly, nearly all of the show attendees should be a potential lead – which means a potential sale. Try to staff your booth with sales people rather than staff who don’t normally sell just in order to try and fill the booth. If you do need to use non-sales staff, give them a specific introduction to say (your elevator pitch from the playbook, for example) and then move attendees to a sales person as quickly as possible. Map out the path an attendee will take through the booth and find something for the non-sales people to say at each point in case a sales person doesn’t become available. 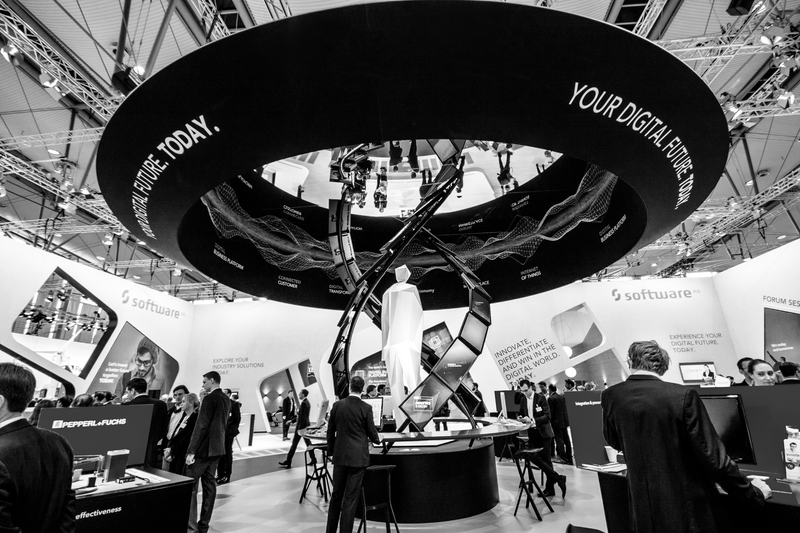 If you can provide an interesting and engaging experience to attendees in your booth, they will remember your business far more easily after the show is over. If you are in an industry where there seems to be an endless number of tradeshows, conferences and events – don’t try to do them all. Using the suggestions above, think about which provides the greatest ROI in terms of sales leads and, out of those, which are the easiest to participate in and most affordable within your budget. It’s important to remember that while tradeshows can be effective, they are just one tactic in what should be a robust marketing toolbox. If you can’t decide whether B2B industry tradeshows are right for your business – or if you need help doing it right – call the B2B marketing experts at The Mezzanine Group. From effective B2B marketing and lead generation planning through to execution, we’re always here to help.